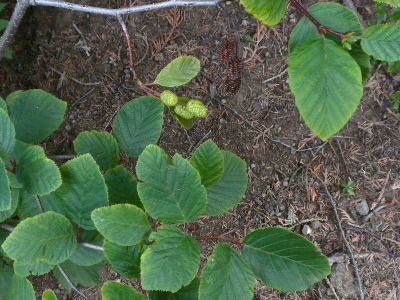 A. crispa of Michigan Flora. Forming thickets in mixed forests and clearings, on river banks, and along Lake Superior on upper beaches, sand bluffs, and rock outcrops. Often more abundant than A. incana in the Lake Superior area, and occurring in much drier habitats, but very local elsewhere. Our plants are subsp. crispa (Aiton) Turrill; subsp. viridis is restricted to Europe. MICHIGAN FLORA ONLINE. A. A. Reznicek, E. G. Voss, & B. S. Walters. February 2011. University of Michigan. Web. 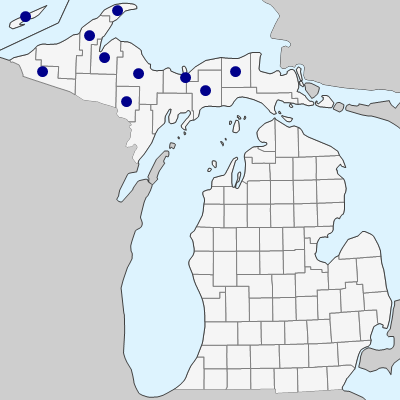 April 19, 2019. https://michiganflora.net/species.aspx?id=549.